Warren Masilamony in the studios of WTV, the Perth community television station. Warren Masilamony, a graduate of Wilfred Laurier University in Ontario, Canada, moved to Australia in 2010. 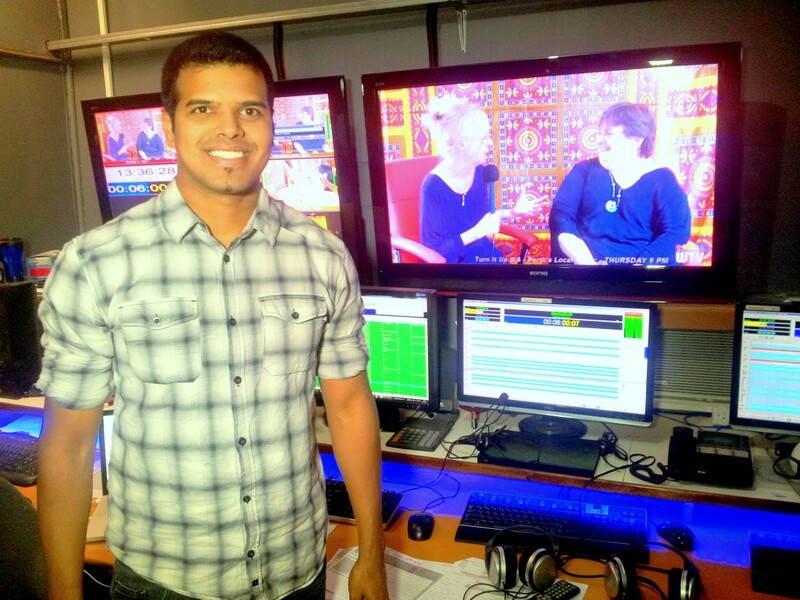 He has travelled to 17 countries and now works as the broadcasting and production co-ordinator at WTV, Perth’s local community television channel. Mr Masilamony tells Juanita Shepherd about his favourite sport, the best thing about Christmas and the power of Jesus Christ. What advice would you give to someone wanting to get into journalism? It is a very tough and competitive industry so ideally you need to have a lot of perseverance. You also need to be practising your craft at every opportunity. It is those opportunities that will eventually land you your dream job. The ability to express my ideas and doing a creative job for a living which sometimes does not feel like work at all. Knowing that your work will reach and influence thousands of viewers is a big plus point, but that comes with heavy responsibility as well. What’s the worst thing about your job? I constantly have to judge my subordinates or prospective journalists. Saying “no” to someone is something I am still finding hard to do. How does your faith help you in your day-to-day life? Faith does help me get through challenging times. What is your opinion of the portrayal of religion in the media? Is it positive or negative? The media will pretty much pick up on anything that is sensational or “media worthy” as we call it. In recent times, the more negative stories have got the lion’s share of attention for the same reasons. Positive stories are hard to find in the media, if at all. Perhaps the religious institutions have to engage more with the media. If it is negative, in your opinion how can we remedy that view? The only way to change the media is though the masses. If there is demand, there will supply. If a thousand people walk the streets chanting “Jesus Christ”, it is more likely to be in the news. There are quite a few but Requiem For A Dream is surely one of my all-time favourites. I enjoy soccer, pro wrestling, theatre and travelling. Who is your inspiration and why? Ted Turner (founder of CNN). The man is the reason why 24-hour news exists today. A true media genius and a great philanthropist as well. I can say graduating from university was my proudest moment and will always be something that means a lot to me. If you could film any story that has happened in the last 50 years, what would it be and why? I would probably film a story about the plight of nations without a state. My experience living in Catalunya, Spain and now Australia has left a deep impression on my world view that there are people who do not have a sovereign country of their own. I think it is a moral obligation to have their stories of self-determination and identity told. In your opinion what do you think makes a good story? Everyone loves an underdog who wins against all odds. Add a worthy cause to the picture and a ruthless enemy to contend with and you have a winning piece. What do you think makes a bad story? Politically motivated stories are the worst because they might appear as fact to some readers. There is also a lot of gate-keeping in the mainstream media where certain figures and organisations are “protected” from critique. What is your favourite song? My music taste varies greatly. At the moment, I can’t get that Gangnam Style song out of my head but one of my all time favourites is Metallica’s Nothing Else Matters. What do you like about the Christmas season? I like all the big lights, the getting together and the food. I am also a big fan of Christmas morning cartoons. Can you tell us one of your New Year’s Resolutions? I don’t really make any New Year’s resolutions. I can’t be bothered waiting that long. I like my resolutions here and now. How did you get into television, film and the media? Have you always wanted to do it? Yes, I cannot think of any other industry I would be part of. I have always aspired to work in film and television and it was my main motivation to go to university. I did a couple of internships and freelance work after graduation and soon after was offered a position at West TV. With the advanced technology we have today, where do you see the future of print journalism? There will be more online media and advertisers will see that as a viable option. Traditional print journalism will not erode away completely though, but the environment will be a lot different. Online is best suited for shorter, more compressed stories or news items as most of such content is written for the smartphone and tablet users in mind. But for a full comprehensive feature, the traditional media will still hold its weight over the former. Graduating from Fremantle's University of Notre Dame in Politics and Journalism, Juanita has been writing for The Record for almost a year, first as an intern and now as a permanent journalist. Juanita is a hopeless romantic who enjoys writing stories which encompasses both her love of history and romance. The Record is licensed under a Creative Commons Attribution-NonCommercial-NoDerivs 3.0 Unported License. Permissions beyond the scope of this license may be available at www.therecord.com.au.